Elegant petits fours carefully prepared and decorated for your special occasion. 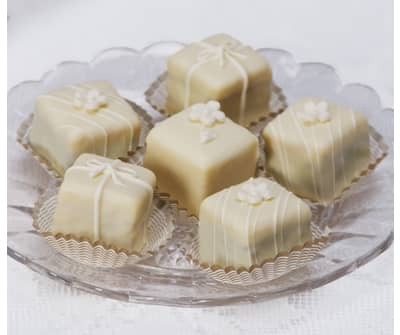 Half the size of our classic petits fours but equally as elegant for your blessed event. We guild each moist cake with dreamy motifs of Gift Packages and dainty White Chocolate Flowers for a truly elegant presentation. This petit four assortment includes Strawberry, Raspberry, and Bittersweet Truffle flavors.